We really have reached the apocalypse, my friends. Get into your fallout shelter as soon as possible because the way I see it, nuclear war can't be more than a few months away now. My evidence? Dattebayo Fansubs, the largest and most prominent group currently fansubbing anime cornerstone Naruto, has announced that they will cease all distribution of Naruto fansubs as of January 15, 2009. Why the change of heart? As Ani-Gamers reported earlier this week, Viz Media announced that they would be streaming the latest episodes of Naruto Shippuden on both Naruto.com and CrunchyRoll, and would be caught up with the Japanese broadcast by January 15. In response to this amazing announcement, Interactii, founder and current owner of Dattebayo fansubs, posted a long message explaining his history with Naruto fansubs. Near the end, he explains his reasons for deciding to drop Naruto. "Like any symbiosis, you have to know when its time to move on. That time has come. Viz and Crunchyroll have gotten their acts together and are trying something new, with one of the most popular shows in anime today. I, and the rest of the staff, know that if we continue to subtitle it, they will have to ask us to stop. That's something they probably don't want to have to do, because it will most likely make all of you very mad at them. That's something they really don't deserve." Naruto fansubs are the most popular ones out there, and many - myself included - believed that Viz could never truly stop the flow of illegal versions of Naruto. Now they have not only provided a legal, free alternative to fansubs, but fansubbers have stood up and defended their vaunted "Code of Honor." 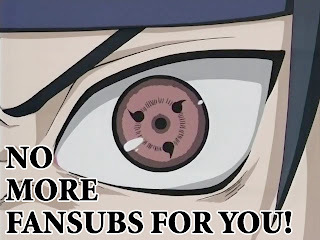 Even though Dattebayo did not receive a Cease and Desist letter, Interactii has stood up and admitted that his fansubs are a promotion for Naruto, not a replacement for legal versions. If there is anything better than this that could have happened in the fansub debate, I can't think of it. Bravo, my good sirs. Bravo.